Much like Punjabi and Gujarati girls, several interesting Bengali heroines too have vied for our attention and love in Hindi films over the years. While Sonakshi Sinha, who received a lot of acclaim for her role of Pakhi -- daughter of a Bengali zamindar -- in Lootera, she plays a Bengali girl yet again in Tigmanshu Dhulia's Bullett Raja. Let's take a look at other Bengali female characters that have stayed with us in recent times. Debutante Ileana D'Cruz won many hearts with her character in Anurag Basu's Barfi!. A sufferer in silence, Ileana's Shruti marries her fiancee even though she's fallen in love with Barfi and later is instrumental in reuniting Barfi with his to-be wife. Priyanka Chopra's Jhilmil, the autistic heiress of a huge fortune and Barfi's childhood friend, displays immense spirit and strong will to be with her loyal friend and keeps him company till the very end. Chopra received a lot of praise for her performance. 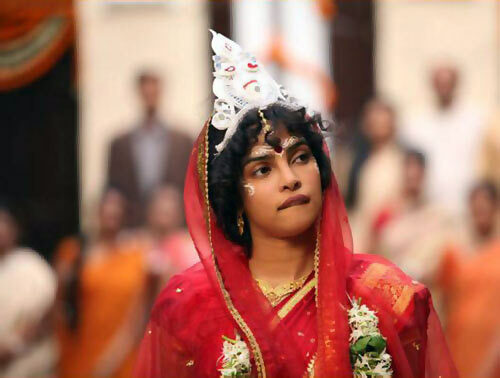 Image: Priyanka Chopra in Barfi! When Delhi boy Vicky falls in love with bank employee Ashima Roy, they make for an unlikely pair -- he is boisterous and she is calm, composed. But Ashima comes into her own as she lets go of her fears and embraces life. In Ashutosh Gowaiker's ill-fated period film, Deepika Padukone plays Kalpana Dutta, a significant leader of the Chittagong armory raid in 1930. While the film, and her performance tanked, Deepika's crisp saris and braids made quite a statement. Konkona Sen Sharma's Ayesha's sensible side in Ayan Mukerji's directorial debut works as a buffer as well as a sounding board for Ranbir's young and restless Sid. She provides direction to his life and brings order in not only his personal space but also his mind. Vidya Balan's exemplary debut turn as Lalita, a righteous Bengali girl who lives with her relatives since her parents passed away in a car accident. Lalita stands out in the film with her immense courage even in the face of adversity and her gorgeous outfits in the film. In Sanjay Leela Bhansali's take on Devdas, Aishwarya portrays the often playful and classic beauty Paro, dressed in colourful saris and long hair. While her plans to marry her childhood sweetheart Devdas are thwarted by his elitist mother, she stands steadfast with her mother's decision to marry her off to someone else but remains devoted to Devdas. Local goon Lallan Singh's Bengali wife Shahshi Biswas is a fiery young woman, who doesn't approve of her husband's occupation in Yuva. While she religiously tries to dissuade him, she refrains from unnecessary theatrics when her words fall on deaf ears. Rimi Sen's Sweety is quite a looker and a devoted wife to ACP Jai Dixit. While unlike most wives of cops who fret over their husband's safety, Sweety is more involved in her own world and prone to ranting in her mother tongue.